We are dedicated to providing the very best dumpster rental experience possible for you or your clients. Here's how we make sure the rental process goes off without a hitch! 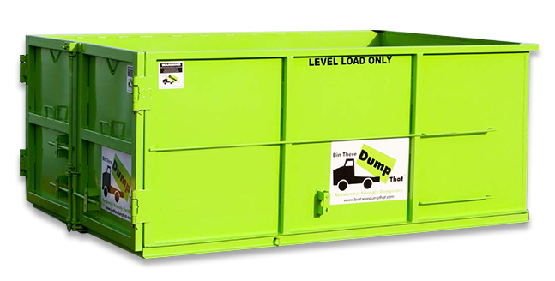 Bin There Dump That Portland is your residential and commercial-friendly dumpster rental service for homeowners and contractors in and around Portland, Maine. Since late 2017 we have prided ourselves in providing attractive-looking, drive-way safe roll off dumpsters of all sizes including 6, 10, 14 and 20 yard dumpsters. We pride ourselves on providing a hassle-free, straightforward experience. When you order from Bin There Dump That, we want you to know you are ordering a safe, quick, and reliable dumpster rental service with no hidden fees or surprise charges. 3) Reload and remove the wood slabs without any help from yourself or your crew. 4) Sweep up after the bin has been loaded to ensure the area is cleaner than when we first arrived! Our dumpsters are skinnier than most, meaning we can down those tight streets and places that other guys can’t! No matter how large or small your project may be, Bin There Dump That Portland has a bin for you! One quick phone call to our friendly operators is all it takes to get started. No hassle and no stress, when you order from us you order from the best! Continue scrolling down to meet your friendly Bin There Dump That Portland operator, as well as a full list of towns and cities served in and around Portland Maine! Bin There Dump That services a vast area of Maine, so if your town is not listed please contact us to see if we deliver to your area. Our friendly professionals will walk you through the process of renting our waste bins every step of the way. From choosing the size you need and all of your pricing options to determining how long you will need to have the dumpster and a schedule for delivery and pick-up, we will make our services streamlined and convenient for you. Bin There Dump That has pricing plans and flexible schedules for commercial and residential waste removal. We can work within your budget and schedule to find a plan that suits your needs. We also have adjustable rates, since we know that your schedule can change and so can the amount of trash you thought you had. Just give us a call and our staff will change your schedule, pick-up time, and price based on your new information. 1. Contact us for an estimate by phone or online. You don’t have to know all of the answers yet to what you will need. With a few simple questions, we will help you clarify what you are using the bins for, the amount of trash you expect to end up with, and more. Those questions will pinpoint the size of the waste bin you will need and help us to get you a final price without any hidden fees and surprises. 2. Make a drop-off schedule. We deliver to you, wherever and whenever you want us to drop the dumpster off. With specific details, you don’t even have to be on the property, as long as we know exactly where you want us to leave the bin. If the best way to access the bin is to set it on your driveway, but you are worried about the residue left behind, rest assured that we use protective boards under each bin so it won’t touch your pavement, and we clean up any mess left behind so no one will ever know we were there. 3. Make a pick-up time. Schedule ahead of time so you know when to have your debris ready or call us when the bin is full and we will come haul it away. Our professionals handle your trash responsible, letting you avoid the dumpster fees and loading and unloading stresses. If you are new to Portland or just ready to downsize your junk pile, call Bin There Dump. No job is too big or too small! We have locations throughout the United States for your commercial or residential waste removal. Remember, to you, it may be just trash, but to us, it’s our livelihood! When you are ready to clean out your home or business, call Bin There Dump That for all of your dumpster needs. Your local Portland, Lewiston / Auburn dumpster rental operator is Steve Jones. Central Maine - Lewiston, Auburn, Augusta, Winthrop.